At a fishing lodge in the wilderness of Southern Labrador in Canada, a gourmet meal is prepared nightly for the guests who come here to stay. 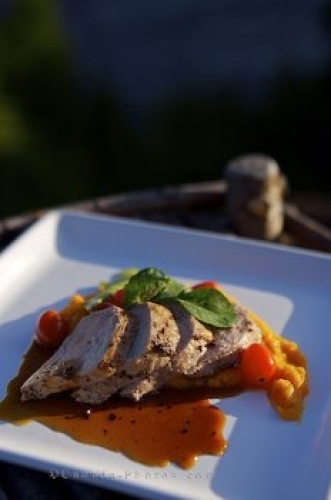 A gourmet meal of Pork Tenderloin is a favorite amongst the guests who come to the Rifflin'Hitch Lodge in Southern Labrador for a fishing holiday. The Pork Tenderloin is nicely arranged as it sits in a specialty sauce with vegetables decorating the meal. On a warm evening, many guests prefer to eat outdoors while enjoying the view and the gourmet chef will serve this fine meal to guests on a square white plate. Pork Tenderloin meal at Rifflin'Hitch Lodge, Eagle River, Southern Labrador, Labrador, Newfoundland Labrador, Canada. Picture of a gourmet meal prepared for the guests at a fishing lodge in Southern Labrador.